Every Sunday night when I was growing up, my dad would pick up ice cream sundaes from our local diner and we would eat them together while watching The Simpsons. It was a great tradition, but as I got older I lost interest in the show and moved on to more sophisticated programming like Nick News with Linda Ellerbee. 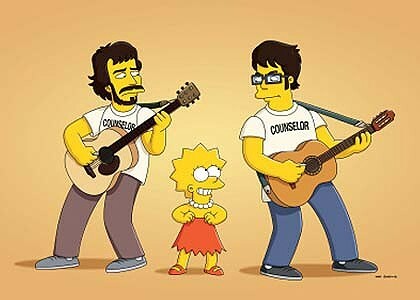 When I heard that this week’s Simpsons episode would feature brilliant folk parody duo Flight of the Conchords, however, I had to tune in. Little did I know how much the episode would appeal to me: it focuses on artists and arts education, specifically Lisa’s week-long trip to an arts camp. Lisa is sent to the camp while her brother, Bart, is in Stockholm accepting the Nobel Peace Prize with Krusty the Klown (of course), and she immediately falls in love. In her week at camp, she performs mime and Mame, makes wallets with Stephen Sondheim, and learns that artists “make society see its faults clearer”, “help stamp out oppression and wars”, and “end poverty with music and dance”. “I’ve finally found the place I belong,” Lisa sighs. Soon her week is over, however, and she has to return to school where the bullies ask her about “farts camp” and her teachers tell her she’ll never reach her dreams. While in my experience, being an artist isn’t quite as unpopular as it is in Springfield, I certainly identify with being the awkward kid in school and then finding a home in the arts; one of the few things I liked about elementary school was my after-school drama program. And now, as an arts educator with Young Playwrights’ Theater, I get to see this in my classes all the time: kids who are uncomfortable and unsure of themselves finding their footing through drama, writing, music and dance. While The Simpsons hit the nail on the head with the importance of arts education, what I found most interesting and relatable about the episode was the uncomfortable truths it revealed about working as an artist. When Lisa runs away from home to find her camp counselors in Sprooklyn, Springfield’s most artistic borough, she discovers that life as an artist is not all she dreamed it would be. By day they work at a sandwich shop, stealing tomatoes to get by, while by night they play guitar in a run-down, nearly empty night club. “Are you saying that arts camp was a lie?” Lisa asks in horror. While her counselor responds sheepishly with, “Well…not the swimming”, I have to disagree. 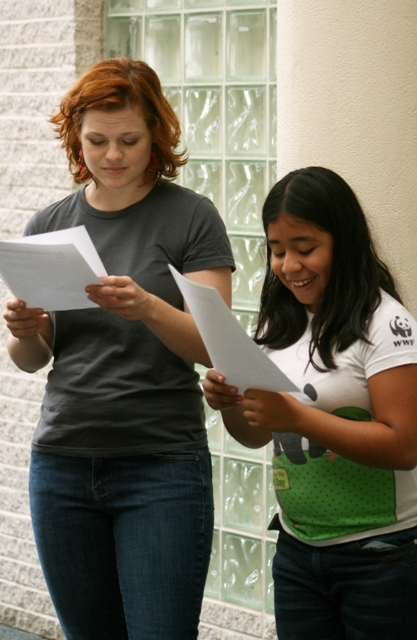 All of us who work in the arts have that shattering moment when we realize that what we love most in the world offers little comfort or stability, which is why the passion that Lisa discovers at camp is essential to a career in the arts. Even those of us who are fortunate enough to make our living in the arts have struggled and paid our dues with less fulfilling day jobs, but the end result is getting to do work that we love and believe in, and getting to work with others who are equally passionate. In the end of the episode, Lisa decides to return to Sprooklyn when she is older and less naïve, and even though The Simpsons haven’t aged in 22 years, I hope she does. I know she could find an easier life in a more stable career, but nothing is worth trading the one place you know you belong.